I know this because in my great desire to maintain cultural literacy, I’ve come across an animated tale of Beatrix Potter’s book ‘A Tailor of Gloucester‘. I’m hoping that Pavlova, our cat, will tell us sometime tonight where it was she went to – and what happened during those months of her disappearance. Meanwhile, we have some clues. 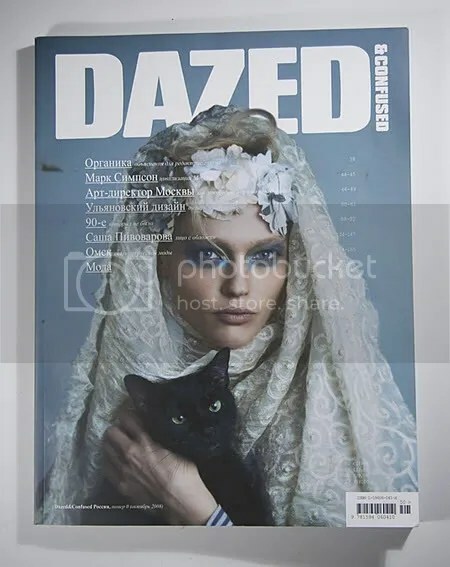 My daughter found a photo of Pavlova in a Russian fashion magazine. Could our Pavlova have wanted to take up the career of an international spy? Or alternately that of a supermodel? And if so, how did she make it to Russia and back, ending up in the now-cold and barren hayfields of Appalachia still safe and sound? We know for a fact that it is Pavlova in the photo. We recognize her. If you have not yet discovered that animals can speak on Christmas Eve – and would like to learn all about this, here is the tale of The Tailor of Gloucester on YouTube. This is Part One. The other parts can be found on YouTube by the mere click of a finger. This segment is memorable for the beautiful rendition by carolers who come to the door (of the house where Beatrix Potter is starting to write her tale) of ‘The Sussex Carol”. Christmas is simply not the same without it.